Two mentoring events have been offered by the Foundation attracting more than 250 students and young professionals. The first, Speed Mentoring, was hosted at the Royal Garden Hotel featuring 22 mentors from Europe, Asia and North America. Several among them were able to keep in touch beyond the event and one mentee went on to secure employment at Estee Lauder as a result of this effort. As part of the British-Iranian Community Development Organisation’s (BICDO) Community Fair, Persia was invited to coordinate a second event, Mentorshop. Ten mentors from around UK were included in this effort. 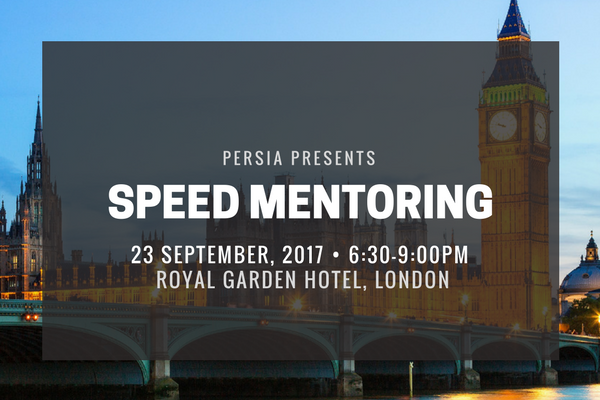 Mentoring is an important aspect of our work at Persia. Involving Millennials and Generation Z is at the core of our empowerment efforts. While our events offer intensive exposure to a range of professionals and information in their respective areas of expertise, our office continues to work with interested volunteers cultivating soft skills with a focus on initiative and creativity. Each round of volunteering with Persia involves an eight-week-long period of collaboration. Volunteers may work independently or in groups. While some applicants are of Iranian descent, Persia also welcomes young talents who are studying about its areas of focus, enabling them to expand their knowledge and skills while contributing to the important work of the Foundation. Applicants are accepted after a rigorous application process, making them an exceptional group of future enablers.